You are here: Home » MEDIA » Books » Invisible Ecologies by Rachel Armstrong (book review). 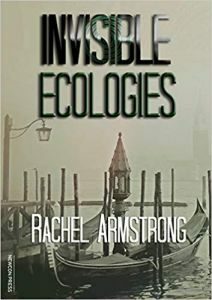 Rachel Armstrong’s second novel ‘Invisible Ecologies’ is subtitled ‘Songs Of The Ecocene II’ although, from what I could tell, it is unrelated to last year’s ‘Origamy’, which is now volume I of the series. The interesting thing about this series title, I thought, is that actually when you step back and think about what you’ve read, ‘Invisible Ecologies’ takes on the aspect of a song rather than a novel. It’s not written as a song of course, but you end up with the impression of it having been some kind of epic folk ballad. As with her first novel, Rachel Armstrong has written the book in very short chapters, many of them only a couple of pages long and some only a single paragraph. Some chapters consist of a poem, which is a form of literature I’ve never grown an appreciation for. Most of the chapters follow the life of Po, which in places reminded of ‘The Life Of Pi’ when Po and his sentient floating island friend Po go on unlikely adventures across the world’s oceans. These whimsical sections are interspersed with Po’s life growing up on a boat in the Venice lagoon and meeting random, instructive characters on his wanderings through the city. In the background, there are also occasional chapters about a young scientist attempting to create emergent life from unconventional substrates, the kind of life evident in Po. From time to time, I would pause and wonder where the book was heading and occasionally I would feel as though I were attending a lecture on environmentalism and innovative recycling methods. These interruptions to the gentle flow of the book never lasted long though as I was drawn into the next chapter and the next by the enchanting melody of its story. This future Venice is brought vividly to life by Rachel Armstrong’s unusual descriptions. We’re given visions of the city’s bustling life, polluted waterways, multifarious floating debris, sea-life, pondlife, swarms of insects, innovative environmental technologies, architecture, culture, history, geography and urban legends. It adds up to a wondrous playground for Po’s youth and a fascinating backdrop to the tale. The fact that Po is the viewpoint character means that describing the city and explaining various facets of its culture, history and technology sometimes have to strike an awkward balance with the supposed comprehension of a young child. The story starts at Po’s birth so that, while it is narrated by Po, it takes on the aspect of a third-person narrator. In some episodes of Po’s youth, the adults of the story explain difficult words they have used, as you would to a child, but in other passages they hold forth on very complex subjects while using a wide-ranging vocabulary and Po is able to engage with them on equal terms. All together, this pushes the narration back from an immediate first-person viewpoint to more of a series of reminisces from a point somewhere further ahead in time, where the exact details of conversations and of Po’s wide-flung adventures are re-interpreted through the lens of hindsight. I was captivated by this book, despite its somewhat meandering nature and the sections of poetry. It’s an uplifting tale, alive with humanity and optimism and leaves the lasting impression of a book entirely comfortable in its own unique style. « Game of Thrones (last season, last trailer, last body-count).